How much compensation can I claim for an airbag injury? The use of airbags are recommended by the Royal Society for the Prevention of Accidents to be used alongside seatbelts as an effective secondary safety measure for the protection of drivers and their passengers. However, although airbags can reduce the chances of serious injury, they can actually be the cause of injuries too. If you have suffered such an injury, even though the airbag may have prevented you from suffering more severe injuries, you may still be able to launch an airbag lawsuit to claim for the side effects of airbag deployment that you have suffered. Please read on for more information on airbag injury claims. 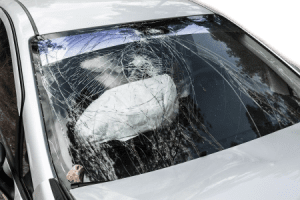 What is an airbag injury? What can be claimed for after an accident causing an airbag injury? How much compensation will I get after an accident causing an airbag injury? Why choose us as your claims service for an airbag injury claim? Although airbags are installed in vehicles to help save lives and prevent serious injuries, there are risks of injuries being sustained due to the deployment of the airbag. If you have had an accident that has resulted in you suffering from airbag injuries to arms or perhaps airbag injuries to sternum or any other airbag related injury, you may have incurred financial losses due to extra expenses such as medical bills, or due to income or benefit loss, in which case you might want to claim for airbag injury compensation. This guide will help you to gain lots of information about how to start airbag injury claims, what it involves, eligibility and much more. Carry on reading for more answers to your questions and feel free to contact us to discuss your case if you are still uncertain about making an airbag injury compensation. When a vehicle with airbags is involved in a crash, the airbags are inflated and deployed in a blink of an eye, in fact it takes less than 1/20th of a second for this to happen, the force of the airbag being deployed is explosive. Although the airbags are there to prevent serious injuries from the accident, unfortunately sometimes the sheer force of the deployment of the airbag itself can be enough to cause direct injuries. The injuries sustained from the airbag are often more severe if the driver or passenger is sitting too close to the steering wheel or dashboard. It is recommended that you position your seat as far away as you possibly can and wear your seatbelt to reduce the chances of injury from the airbag. There are a number of injuries that may be sustained when an airbag is released, some more serious than others. In fact, due to the risks of injury from an airbag releasing, there are certain circumstances where it is safer for passengers to not use, or sit in the seat where there is an airbag fitted. For example, children in rear facing seats should not be placed in the front seat where there is an airbag fitted as they could potentially be seriously injured or killed if the airbag is deployed. Some vehicles have an on/off switch so that if a child has to go in the front seat, the airbag can be switched off as that is the safer option. If you have been injured from an airbag being released, in order to make a claim, another party must be liable for causing the airbag to be deployed. This may be the person responsible for causing the accident, it could be the manufacturer if the airbag was faulty, or the car manufacturer themselves if the airbag has been fitted incorrectly. Please give us a ring and we will help you with your airbag injury claim. Photos – If you can, take photos of the scene of the accident, vehicle positioning, damage caused etc. Also take photos of your injuries to give visual proof of your suffering. Medical Report – Have your injuries checked by a doctor. For health reasons this should automatically be the obvious thing to do, but also, by doing so, a medical report will be made and this will be used to help determine the amount of compensation owed to you. Witnesses – Obtain any witnesses details so that they may be contacted to make a statement. Witness statements are really good for strengthening your case. Proof of Expenses – Keep a record and the receipts of any extra costs incurred as a direct result of your injuries such as prescription fees, counselling costs etc. These will be included in your claim. Write everything down – Write everything down about the accident that you can remember including the time running up to when it occurred. Making a compensation claim can often be a lengthy process that is full of complications. Unless you are personally experienced in this field, to have the best chance of a successful claim, it is a good idea to seek legal help or even better, to instruct an experienced legal team to take control of your airbag injury claim. We are legal frim that have years of experience in personal injury claims with a brilliant track record of getting our clients the payout amount that they deserve and would be happy to help you to get the airbag injury compensation amount you are entitled to. All you would need to do to get the ball rolling, is to ring us on 0800 073 8804. When we receive your call, we will offer you a free consultation. During this consultation, you can ask as many questions as you need to regarding your claim and we will also use the session to gather all the information from you that we can to determine the facts of your case. When you are ready, we will launch your airbag lawsuit for you to begin the process of claiming the compensation you deserve . You’ll be pleased to know that all of our specialist solicitors work on a No Win No Fee basis so there is no financial outlay for you to worry about. Sometimes a local medical needs to be arranged. We would arrange this for you at a local clinic that is convenient to you, but don’t worry, there is no cost involved for you to have this done. We can discuss this in more detail during your free consultation if you have any questions regarding this. General Damages – The pain and suffering you have experienced will be reflected in the amount of compensation that you receive. Medical Expenses – Any extra costs that you have incurred as a direct result of your accident such as prescription fees, counselling costs, private medical care etc, can be included in your claim. Loss of Earnings – If your airbag injuries, such as injury to hands or perhaps airbag injury chest pain and so on, have prevented you from working, then you should include loss of income and future loss of potential income in your claim. Travel Expenses – If you have had to pay for extra travel expenses or for any vehicle adaptions due to the injuries you have sustained, then you can claim for these too. Airbags are actually designed to deploy on the second impact in an accident and are based on a frontal collision of the vehicle. The airbag is fitted within the steering wheel or front dashboard and looks like a deflated balloon. When a collision occurs, it inflates at tremendous speed and under high pressure to protect the driver or passenger from colliding with the interior of the car. When the vehicle is in a collision, there is a deceleration sensor that makes a small charge. This charge makes a temperature change which goes from normal to 700 o/c and back in 0.1 second. When this happens, the airbag is deployed in a fraction of a second. Immediately after the airbag has inflated, it then deflates via vents within the material that permit it to do so. The deceleration sensor needs to be set accurately because if set too high, the airbag may not be deployed if in a lower energy crash when it should’ve been. Also, if set too low, minor shunts could set the airbag off when it wasn’t really needed. The timing of the deployment of the airbag also needs to be correct. If it is too late, the driver / passenger may already be in the ‘inflation zone’ when it deploys which would increase the risk of a serious injury from the airbag. Also, if the airbag deploys too soon, due to the immediate deflation after deployment, the airbag may already be deflated by the time the occupant hits into the steering wheel or dashboard, rendering it useless and therefore serious injuries could result from this. There are so many different body parts exposed to airbags that the injuries sustained can vary a great deal. The difference in the types of designs of airbags available can also have an impact on the type or severity of injuries a victim can have. Some of the reasons that commonly cause people to get an airbag injury are the speed at which the airbag is released, the materials used in the airbags and also whether or not a seatbelt was being used as well. Bruises to the upper extremities, face, chest, knees and contusion to the internal organs. Grazes to the face, upper extremities and chest. The cervical spine may suffer from fracture, blunt trauma or sprain. Burns on the hands, upper extremities or chest. The skull or rib cage can be fractured. A fracture or break can occur to the wrists, face or upper extremities. Swelling or bruising of the brain. Concussion injuries or loss of consciousness. Tears to the spleen or liver. Tears to the brain stem, lungs, heart, arteries or veins. The heart muscle can rupture inside. Traumatic brain injury or compression of the brain. Eye injuries such as retinal tears, corneal abrasions and globe rupturing and conjunctivitis can occur. A pregnant lady’s foetus may suffer with trauma or the placenta could be punctured. The throat may have irritation, coughing or asthma attack may happen. Fingers may be sprained and trauma to the wrists. Airbag dermatitis may appear which is an irritation of the skin. Some of these injuries can be very serious and even lead to a disability of some kind, ongoing chronic health issues, or potentially premature death. Unfortunately, accidents can’t always be avoided but precautions can be taken such as driving with defensive driving skills and taking note of the things you can do to lesson or avoid injury if ever an airbag is deployed. The severity of an airbag injury and the potential on going effect it may have on the life of the claimant in the future is often difficult to assess. It is best for the claimant to have a medical examination so that the injury can be assessed thoroughly and any treatment that may be necessary can be decided upon and recommended. The medical examination is just a simple and quick routine check over that does not cost the claimant anything and is held at a local medical centre that is convenient for the claimant. Unfortunately, we cannot give an exact answer to this question as every accident causing an airbag injury is unique due to such a great variation in circumstances surrounding the accident, the type of injury, and the severity of the injury. Recovery time can vary too from person to person even with the same type of injury, as does medical and travel expenses, loss of income and benefits. All are different in each case and so, even if a figure was given, it could only be an estimate. With this in mind, what we can do is show the average compensation payout amounts given in passed injury claims for certain injuries that could potentially be sustained by a deploying airbag. At least with this, you can get an idea of what you may be entitled to. Severe Head Injury £215,000 - £310,000 This refers to claimants that have suffered severe brain damage, leaving them unresponsive to their surroundings and in a vegetative state. Moderate Head Injury £12,500 - £200,000 Some brain damage causing change in personality, permanent disabilities. Mild Head Injury £1,500 - £9,500 No brain damage occurred but some lasting effects may be present. Severe Back Injury £29,750 - £123,300 Severe injuries to lower or upper back. Possible paralysis or effect on organs in the lower body. Moderate Back Injury £8,750 - £30,750 Permanent damage to ligaments or soft tissues causing ongoing pain and suffering. Mild Back Injury £350 - £9,850 Disc and muscular damage and pain but with good prognosis for recovery. Severe Facial Injury £15,400 - £73,200 Permanent scarring and disfigurement of the face. The severity of the injury will determine how much compensation is paid out. Moderate Facial Injury £12,200 - £27,300 For those with breaks or fractures to the bones in the facial area. Mild Facial Injury £1,700 - £12,350 Mild scarring. Women often get higher compensation amounts. Severe Ear Injury £69,100 - £108,500 Total hearing loss. Moderate Ear Injury £22,300 - £34,500 Total loss of hearing in one ear. The impact on the claimants life will determine the compensation amount. Mild Ear Injury £4,300 - £37,500 Hearing reduced in one or both ears or the occurrence of tinnitus as a result of the airbag deployment. Severe Eye Injury £81,200 - £205,300 Total loss of sight in both eyes would warrant the maximum amount. Total loss in one eye with or without reduced sight in the other eye would also fall into this bracket. Moderate Eye Injury £7,100 - 49,400 This would be for claimants with total loss of sight in one eye or significantly reduced vision in one eye. Mild Eye Injury £1,600 - £7,600 Pain and vision problems. Wrist Injury Mild - Severe £2,550 - £44,500 Damage to the wrist but with full recovery to permanent damage resulting in no wrist function at all. Finger Injury Mild - Severe £375 - £69,330 Broken or fractured finger/s with expected full recovery to severe damage and possible amputation of finger/s. Severe Hand Injury £46,300 - £151,250 Permanent loss of function of one or both hands and possible amputation. Moderate Hand Injury £22,500 - £47,750 Disfigurement and reduced function of one or both hands. Mild Hand Injury £700 - £22,300 Fractures, soft tissue damage, scars etc with expected good recovery. No Win No Fee quite simply means that there are no legal fees to pay unless your claim is successful. All of our solicitors work on this basis. If your case is a success, we would take a small percentage of the compensation amount. This way there is no financial outlay for you at all. If the airbag accident claim is unsuccessful however, we swallow the costs of our legal fees and you don’t have to pay a thing. For people who have cost concerns, this is ideal as it takes away the worry of not being able to pay the legal bills, a bit different to if you were to employ the services of a solicitor who is paid by the hour regardless of the outcome of your case. With our No Win No Fee approach there are no risks for you and you can only gain from our service. If you want a professional service that will strive to get you the maximum compensation payout you are entitled to, then look no further than us. We are a team of highly experienced personal injury claims solicitors that have years and years of experience and have a fantastic track record of successful claims. We really work hard to get the best result for our clients that we possibly can. We work quickly and efficiently to make the claiming process run as smooth as we can for you so that you can concentrate on your recovery and not have to worry. We are a caring and compassionate team that understand you are suffering and will work on your behalf to the best of our ability to get the compensation amount that you deserve. If you have been involved in an accident causing an airbag injury and want to make a claim, all you need to do is call us on 0800 073 8804. A member of our professional team will answer your call and will help you in any way that they can. We will answer any questions you have regarding making an airbag injury claims (x4) as accurately as possible and we will also go through the claiming process with you so that you are fully aware of what is involved. We are a friendly and professional team and you can rest assure that your recovery and compensation claim will be our main priority. This link leads to government recommendations on staying safe when in a vehicle fitted with airbags. This Royal Society for the Prevention of Accidents factsheet has information about airbags such as why they are used, how they work, reasons as to how and why injuries from an airbag deployment may occur and how to lower the risks. This link takes you to another of our guides about car accident claims that may be of use to you.